Given the recent brouhaha over Dan Brown's comments about Manila (ridiculous, really), it seems almost ironic that this review for National Treasure is up for today. 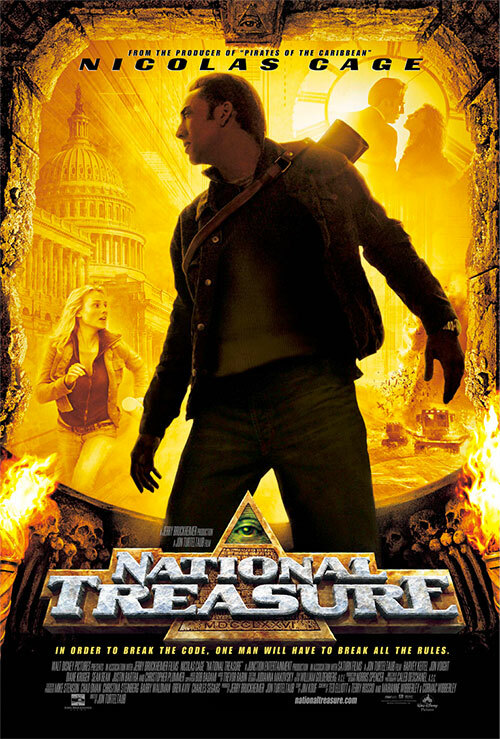 Let's face it - the National Treasure movie franchise is right in the same vein as Dan Brown's famous novels. After all, we all desire for there to be secrets hidden in plain sight and buried treasure waiting to be found even in these modern times. It's interesting to me how these movies are yet another product of Jerry Bruckheimer, a name I used to most associate with the CSI TV series. But that's just his small screen work - it seems when it comes to the movie sphere he's more into this big action-adventure pieces. It's not about historical accuracy or anything important like this - this is just about putting on a good show. I still surprises me how this movie spawned sequels - then again I have to recognize that most folks don't share my opinions of Nicolas Cage. But hey, we all like different things in life. Synopsis: National Treasure is a 2004 action adventure movie directed by Jon Turteltaub with a screenplay by Ted Elliot, Terry Rossio, Marianne Wibberley and Cormac Wibberley. It was released by Walt Disney Pictures. Benjamin Franklin Gates (Nicolas Cage) is the latest in a long line of treasure hunters who believe that there is a "national treasure" hidden by the Founding Fathers of the United States. It's a treasure believed to have been spirited away by the Freemasons and is so vast that no one country should be able to possess it. But naturally the historical community don't think kindly of the Gates given their almost fanatical believe in this treasure and thus don't hold much credibility. But Gates believes that he has an actual clue that stands a chance of leading him to the treasure, and thus he's now on an expedition funded by Ian Howe (Sean Bean). He's joined by his friend Riley (Justin Bartha), who has quite the knack for computers. At the start of the movie they've journeyed to find a Colonial ship lost to the Arctic in the hopes of finding another clue that will help them find the treasure. But as soon as they find the ship, things start to go awry as Ian clarifies his exact position in this matter - and how that plan doesn't include Gates. To be fair, Nicolas Cage playing a historian isn't quite as bad as Mark Wahlberg playing a science teacher. But it's not too far either and I spend a lot of the movie finding it hard to believe that Cage is some sort of Indiana Jones type of character given the degree of intelligence and sheer brilliance needed for such a character. And come on, this is Nicolas Cage! The only part of the role that he captures rather well is the fact that I would totally believe he's a madman. What annoys me more is how this led to a lot of folks going online and trying to figure out if the movie's claims were real. And this is a complete work of fiction, yes, but some of the assertions of the story are just so preposterous that I don't understand how anyone could think that this movie might be even remotely real. But such is life and we have to deal with the world at large and movies like this that try to capitalize on the gullibility of the average viewer. Then again, I never claimed this movie is meant to be historically accurate. It's just mean to be wild and fun and acceptable for the whole family from a ratings perspective. And while one can try to just enjoy how the story unfolds, the rest of my brain continues to rebel and some of the really bad plot twists. I need the movie to make some degree of sense, even given such a fantastical premise. National Treasure is a decent enough adventure movie but not much else beyond that. If you can stand Nicolas Cage, then the movie might work for you. If you can't stand him trying to appear smart like I do, the the movie can be pretty bad indeed. Well you know where I stand, and thus I can only rate the movie as 2 crazy little clues and archaic devices out of a possible 5.